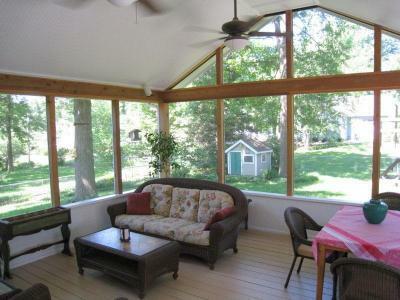 Is the inside of every screened porch the same? Last week we wrote a post about whether all screened porches are the same and the degree to which they can differ. In that post we focused primarily on the outside of the screened porch. 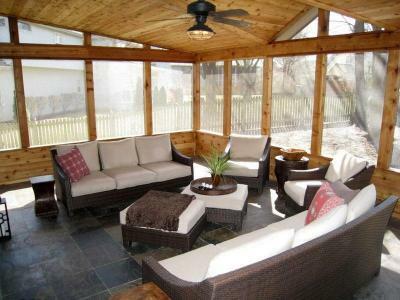 This week’s I’d like to focus on options and considerations for the interior of your screened porch. The primary components of the interior are the floor, the railing, the ceiling,and the electrical package. Let’s look at flooring first. There are so many more flooring options today than you may think. These primarily include woods, composites, tile, and concrete. To tailor to a more traditional look, you can use the wood floor. Natural wood floors are less expensive than composite floors but do require substantially more maintenance. Where a composite floor is close to maintenance free, a wood floor will need attention every couple of years depending on the wear and traffic. There are some things you can do to keep your natural wood floor looking fresher for longer. One option is to paint your floor. This will provide some level of protection from wear. Another really simple option is a nice large floor rug. Outdoor rugs have also come a long way in recent years. Remember the green outdoor rugs that looked like astro turf? Today a number of companies make rugs designed to withstand some rain and other elements. You’ll want to read the labels to see the degree to which these rugs withstand the elements. Your screened porch will get a minimal amount of water inside as compared to an open porch but water will be a factor. There are some tropical hardwoods that are traditionally used for outdoor. One particular tropical hardwood we used is Ipe. Ipe has a a great number of advantages over pine and pine and still looks very, very rich. It will need to be maintained, either stained or sealed to maintain its rich color. People are also using tile for the floor of their screened porches. There are colors or textures available that you can’t get with wood or composite and tile can have quite a finished look. For your interior porch railing, material options primarily include wood, metal, composite, fiberglass, and vinyl. Like the other components, the differences include the cost and the amount of maintenance. Wood is going to cost less but is going to require more maintenance. Man-made materials such as composite, fiberglass and vinyl will cost more at the onset but very little maintenance is required. Many people don’t want any aspect of their screened porch to require work. They want to rest, relax and minimize any necessity for cleaning and maintenance. Knee wall is also an option. Knee wall introduces a measure of wind and rain protection. Knee wall also serves another couple of benefits. The knee wall can be painted to match other aspects of the house and pull the structure into the overall aesthetic of the house. Knee wall also adds a moderate degree of additional privacy based on the position of your screened porch and the proximity to the areas you would like some privacy from. For the ceiling, we can design open or covered rafters and have a variety of great choices for the ceiling including cedar, pine, bead board, plywood, tongue and groove, and vinyl/PVC. As you’ve begun to plan your screened porch and selected various design elements you like, you may not have thought of the aesthetic differences the different ceiling options can make. A vaulted roof creates a grand, open and airy feel. Traditional screened porches had flat ceilings but today the popular option is the opposite. In my experience, one of the most common upgrades, if you will, is how you configure your electrical. 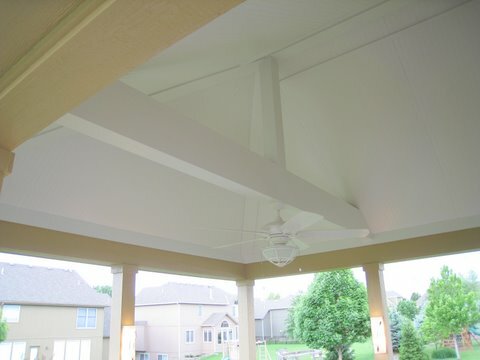 Most screened porches will have a ceiling fan. In addition, you can add built-in ceiling lights, we can wire in and install mounted ceiling speakers, and you may want a number of additional outlets for plugging in things like table lamps, floor lamps, laptop computers and televisions. When you begin to dialogue with a builder, you will quickly know based on your rapport, how they listen and how you feel about their trustworthiness whether that builder will be a good match for you. Before you have a contractor come out, check their BBB rating. Check their reviews on Angie’s List, and review their website to see pictures of their work. Give us a call for a free consultation. We would love to discuss your ideas and propose the best solution for what you’re looking for. (913) 851 – 3325. 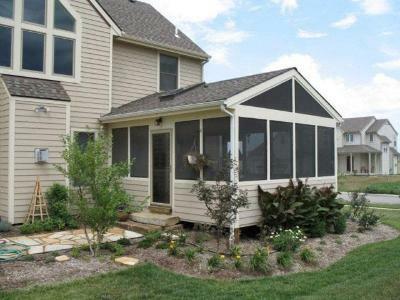 This entry was posted in porches, Room additions, Screen Porches, Screened porch and tagged cedar trimmed screened porch, Leawood Kansas screened porch, Overland Park screen porch, screen porch Brazilian hardwood floor, Screen porch composite floor Kansas, screen porch Kansas City, screen porch KC, screen porch tile floor Kansas City, screen porch wood treated floor, screened porch exotic wood floor, screened porch ipe floor, screened porch Kansas City, screened porch KC, screened porch MO, slate tile floor screened porch on August 2, 2011 by archadeckkansascity.